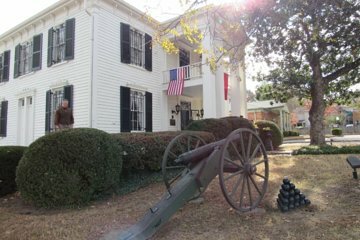 At the Lotz House Civil War Museum in the Nashville suburb of Franklin, enjoy a historic 30- to 60- minute walking tour that tells the story of the Civil War’s Battle of Franklin that took place here on November 30, 1864. Hear stories from the historian guide about the Lotz House’s role in the battle, known by many as the five bloodiest hours of the Civil War. When the Union Army was expecting a Confederate attack, they began to gather soldiers near two houses belonging to the Carter and Lotz families. When it was evident the Battle of Franklin was going to take place, the Lotz family sought refuge in the cellar of the Carter house because their own house had no hidden shelter. The bloody battle went on for five hours and when the two families emerged from the shelter, the outside area was a wasteland of dead bodies and destroyed property. The Lotz House was still standing, but badly damaged. The house became a field hospital after the battle, but bullet and cannonball holes — plus bloodstains on the floors and walls — can still be seen inside the house to this day. This tour is not all about the carnage of the Battle of Franklin, however. Mr. Lotz was a master carpenter and his handiwork is evident — as well as an impressive collection of fine arts and antiques — throughout the house. Step back in time to see and learn about this Civil War-era house with an incredible story. Our tour guide was amazing. She really brought the civil war to life. Everyone in our tour group felt comfortable asking questions and she answered them all. I would highly recommend this tour. This is a wonderful tour and a great place to explore the south. I found out too, that I had read the book about the last civil war wife. The house was really interesting and the little city is a blast and easy to get too. highly recommended. Don't miss this one if you love history. JT was our guide. He was extraordinarily knowledgeable and helpful. We enjoyed the Lotz House experience thoroughly!! Robert was an excellent tour guide. It is a very informative and fascinating tour. This was a very interesting tour. The tour guide was an excellent story teller and knew so many facts that he kept us all captivated and made us want to know more. Enjoyed the tour very much. Robert (our guide) was so good he made me think I was there.